Electrically conductive adhesives are used in a wide variety of industries. The automotive industry, aviation and especially the electronics industry demand electrically conductive materials. Electrically conductive materials are dispersions. They are generally referred to as electrically conductive adhesives, silicones or inks. The materials are divided into different areas: epoxy resins, polyurethanes, silicones and acrylates. Particularly epoxy resins are in use since their properties with solid ingredients are electrically conductive. Common particle materials are silver, copper, carbon, nickel or gold. Another conductive material is the graph, a carbon modification with a two-dimensional structure. In addition to its high thermal and electrical conductivity, this filler is characterized by its low density and high tensile strength. It is still too early to say when the material will be available for industrial applications. But the first test results show that it will be suitable for applications in the electronics industry. Electrically conductive adhesives protect electronic components from electrostatic discharges and also direct mounting of unprotected semiconductor chips on circuit boards, where the chip is glued directly to the substrate. These are isotropic materials that allow electricity to flow in all directions. They are also used for assembly of surface mounting units. On the other hand, anisotropic materials are also available. They allow electricity to flow in only one direction. They are used for making LCD connections (monitors) and RFID antennas. There is great potential in replacing soldering processes with temperature sensitive substrates. The curing temperatures for adhesives are significantly lower than for soldering processes. The adhesives are more flexible than solder and resist better vibrations. Last but not least, many adhesives are free of solvents and therefore more environmentally friendly than solder. The particles in electrically conductive materials often have a diameter of at least 25 μm and are usually used where the shore hardness of the particles exceeds D90. The dry matter content varies depending on the brand and use of the material. Usually 75-90 % is considered as high-density and abrasive materials. The difference in density between the dispersion phase and the dispersion material can lead to sedimentation. Industrial applications, however, require a homogeneous product, since a uniform solids content is required for a valid process. Suitable dispersants are therefore chosen which prevent or reduce sedimentation during storage and processing of the product. The result is a high viscosity for electrically conductive materials. The users therefore face a challenge when they want to dispense these abrasive materials with high accuracy regardless of viscosity. ViscoTec – represented by Scanmaster in Denmark – specializes in emptying, processing and dispensing highly viscous, structurally sensitive and abrasive fluids with precise dispensing solutions. Due to abrasive fillers, hose pumps are unsuitable. Here, Preeflow microdispensers are suitable as they have proven themselves in this field. Preeflows microdispensers are progressive cavity pumps. The stainless steel rotor moves eccentrically in an elastomeric stator. The interaction between rotor and stator creates chambers. The size of the alternating opening chambers is also constant during rotation so that the transferred product is not compressed. Due to this dispensing geometry, a constant volume is always transmitted per rotation relative to the rotation angle, independent of the viscosity of the dispensing material and with pulsation-free material flow. Preeflow guarantees a dispensing accuracy of 99% (depending on the medium) up to 1 µl. Thanks to the compression-free transfer, highly viscous, abrasive and shear sensitive materials can also be applied. The pump technology in this endless piston principle has the further advantage that the direction of rotation can be reversed so that dripping is prevented. 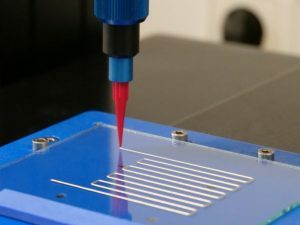 Thread-forming gels, resins or adhesives can therefore be more precisely dispensed. For accurate dispensing of abrasive materials, ViscoTec has developed a new stator for the Preeflow micro-dispenser Eco-PEN330. The new stator material resists the high mechanical loads of materials with many fillers even better than before. The user benefits from even greater process reliability and longer maintenance cycles.